A Towing Service in Oshkosh you can depend on. Having your car towed by and Oshkosh tow truck doesn’t have to be a headache. The Felix Auto and Tire "towing Oshkosh" team tries to make your towing experience as easy as possible since you’ve already had a bad streak of luck when you call us. We offer 24/7 towing services, so you can have peace of mind knowing that no matter what happens any time of the day or night, you can trust us to be there with just a simple phone call! We serve the greater Oshkosh area with dependable, fast towing services. 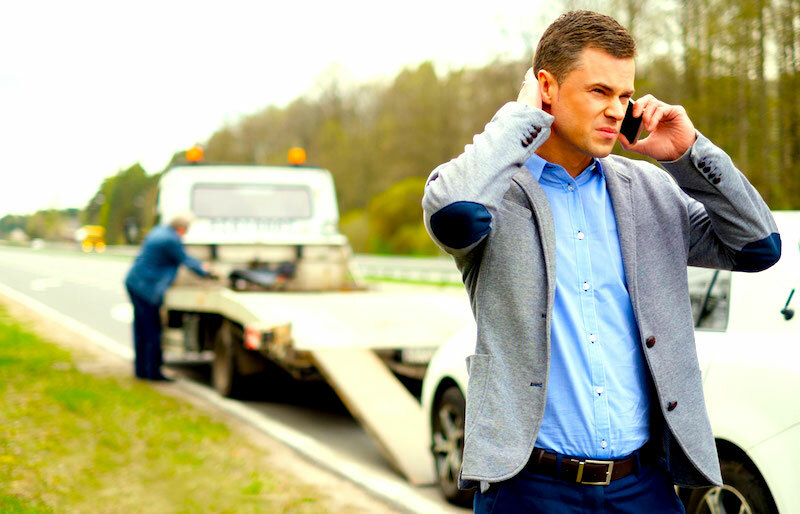 If you are stranded on the side of the highway or in your own driveway, you may be searching for a "towing service near me". Well, you can call us to come get your car and haul it back to our garage to provide the necessary repairs. We love helping our neighbors! If you have an accident or a flat tire ‘after hours,’ some towing services will tell you that they can’t pick your car up until the next day. At Felix Auto and Tire, we don’t believe that’s a very professional way to treat customers and friends. Leaving your car on the side of the road or in a parking lot overnight could subject it to theft or vandalism. To avoid those possibilities, call none other than Felix Auto and Tire to get your car home or back to our shop where it can be stored safely overnight. Any time you need us, we’ll be there. It doesn’t matter if it’s the middle of the night, a weekend, or a holiday. We have staff on call every minute of every day so that, when you need us, we can respond in a moment’s notice. We recognize that you may be traveling with children or someone with health conditions, so we respond quickly each and every time to keep you and your passengers safe, happy, and on the way to where you’re going! People who drive classic cars or expensive, late models are usually pretty picky about the way their precious vehicle gets treated. We completely understand! Our drivers are experienced, and they know exactly how to take care of your valuable investment so that it won’t have a scratch or a ding on it! We carefully haul these beauties and get them back to our garage safe and sound. What makes Felix Auto and Tire really unique is that we give regular, everyday cars the same care that we give classics and showcase models. We double check the connections before we pull into highway traffic so that no further accidents occur after you’ve already had a blowout, breakdown, or fender bender. You can trust our authorized towing specialists to get your car out of harm’s way quickly and safely no matter what you drive. It’s always a bad time to get stranded on the side of the road. No one has time for an accident or to run out of gas on the way home from work, but these things do happen, despite our best planning. Cold temperatures or bad weather can take your luck from bad to worse in one of these situations. When you find yourself in need of a tow, call Felix Auto and Tire for the fastest service in or around Oshkosh, WI! We work as hard as we can to rescue you from cold or harsh weather! Don’t let your fuel level get below ¼ of a tank. Keep supplies such as blankets, bottled water, and non-perishable foods stashed in your car. Allow yourself extra time for travel in case of poor road conditions or accidents. Keep Felix Auto and Tire on speed dial! In the worst weather conditions, you’ll have peace of mind knowing that you’ve done everything you can to keep yourself and your traveling companions safe! Oshkosh Tow Truck…More than cars and trucks! Did you think that’s all we did? No way! Our Oshkosh tow trucks have the capabilities to tow any vehicle you own. From cars, trucks, vans, and SUVs to other types of transportation, we can haul anything with wheels! Besides passenger vehicles, we can also tow motorcycles, boat trailers, and travel trailers. If you own one of these types of vehicles, you may not have known what you’d do if an accident happened while you had a trailer in tow. Now, there’s a dependable towing company in Oshkosh, WI: Felix Auto and Tire! If you’re headed out of town for a camping trip, a day on the water, or a two-wheeled ride on the open road, Felix Auto and Tire will help you get back on the road as soon as possible. We can do most repairs back at our shop in minutes or hours. From changing a flat to installing a new battery, we will work as quickly as possible to get you moving again so your plans aren’t ruined! Delivering fuel to you if you run out. It’s embarrassing, but it happens to the best of us. Whether you have a broken gauge or you really thought you had another few miles, Felix Auto and Tire has your back! Call us and we’ll gladly deliver gas to you wherever you are. We’ve all done this one, too. The Felix Auto and Tire pros have seen drivers lock their keys inside their car while it was running, with children or pets inside, or on the way to a big job interview. We respond quickly and work fast to get your car unlocked in every case! Providing a quick jump start. If you’re battery suddenly gave out on you, call us to revive it! We have all the equipment, so there’s no need to carry jumper cables around with you! When you have a flat tire, you have to make sure that you get it changed the right way. Otherwise, it could cause an accident down the road, literally. Call Felix Auto and Tire for trustworthy tire changing services! Felix Auto and Tire wants to be the preferred choice for towing services in Oshkosh, WI!